you asked for it. 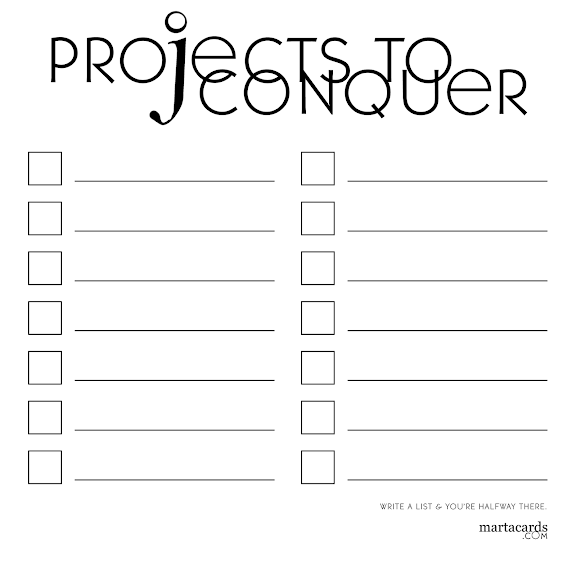 here's a project to-do list printable to print again and again in two thousand ten. am currently filling mine up with freelance projects. hooray for opportunities to work. happy weekend everyone. make it a good one. perhaps this list will come in handy for designating saturday chores. in this house, we'll be having benji's buddy over to play, making trips to the storage garage, vacuuming out the car, baking something delisch, gathering valentiney paper, watching sleepless in seattle on tv and going to zumba class (my attempt to break out of the box). and pointing to our noses, benji's newest trick. oh and i want to write something worth reading. it's at the very end of my list because i am avoiding it like the plague. up next week: the chocolate toffee trifle recipe, my resolution list, and then some. ooh have fun at zumba! the class at my gym fills up way too quickly so i usually don't make it in, but it's so fun! zumba! it's really fun. i get half my workout from trying to hold in my laughter. just go for it! don't be nervous! Can I just say how excited I am for the chocolate toffee trifle?! That put me in an excited mood. Oh, the simple joys. I love this and cannot wait to use it! Thank you! Thanks for the to-do list. I am a collector of various methods to list what I need to do. Thanks also for commenting on my blog! It totally made my day. The review of My Life in France is coming soon! Thanks for the To-Do-List! Looks great! zumba took way too much coordination for me. my hips do not move that way, and i do not look anything like the beautiful polynesian instructors. so i gave it up, but i did decide i would officially certify to teach spin. lovely little list to fill up, perfect-and thanks. and oh so excited to see what next week brings. enjoy your weekending. perfect little list. i'm going to print it and your calendar off and put them in picture frames so i can use a dry-erase maker on top of the glass. thanks for being so generous. i recognized some of your pictures of downtown. i have driven past the blue bell many times and never seen it like that. thank you for making my hometown a little more beautiful. i too am a transplant and have had to learn to find beauty in idaho. thanks again for opening my eyes. Oooo how delightfully final! Conquering projects instead of just checking them off is the way to go! I love your to do list. It's cute enough to frame! sleepless: big favorite. practically memorized. i love that you're breaking it out this weekend. the coffee toffee trifle?! i'm in. resolutions.. also on my blog schedule for next week. i'm excited to read yours, i know they'll be good. a big empty box to check off is one of the best things about listing. love this design job, marta. i printed off a kazillion of these when you first posted it...and i love them!!! i am using several today and they make me very happy:) so i wanted to thank you. I love this list! Thanks for helping me to get a bit organized. Feel free to stop over and grab a featured button! :) Have a great day!